Grantor(s) – The person who creates the trust agreement, also commonly referred to as the Donor, Settlor or Trustor. Trustee – The person(s) or entity responsible for managing, and making distributions from, the property that is held in the name of the trust. Beneficiary – The person or entity who is to receive the benefits of the property that is held in the name of the trust. Essentially, the Grantor at some point transfers title/ownership of assets to the Trustee (as the representative of the trust) who will manage the assets for the benefit of the Beneficiary. 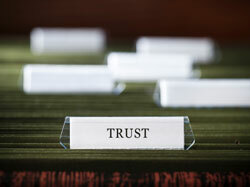 Trusts are extremely flexible and diverse estate planning tools to address any number of issues. The two most common reasons for including a trust in your estate plan would be to hold and inheritance for the beneficiaries until they are responsible enough to manage the funds on their own, or to provide a means to settle your financial affairs upon your death in a manner that avoids probate.